To celebrate the opening of Saturated: The Allure and Science of Color (May 11, 2018-January 13, 2019), Object of the Day this month will feature colorful objects from the exhibition. This post was originally published on July 26, 2015. The postwar design era focused largely on improving all aspects of life at home for those who had maintained it during the war and those who were just returning. 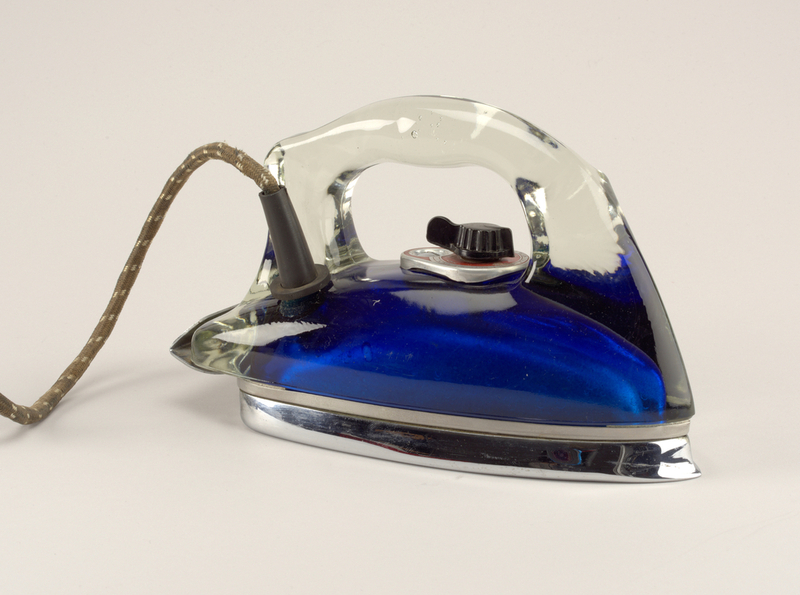 The remodeled electric iron was one among many postwar innovations, but this Silver Streak iron in particular epitomizes the design period. The Silver Streak’s aerodynamic form is immediately recognizable as a result of streamlining, a style that dominated the 1930s and focused on smooth lines, clean forms, and the impression of speed and efficiency. The addition of heat and fabric settings also streamlined the ironing process itself, as it removed guesswork from the chore and allowed the user to determine how much power would be required for individual laundry items, preventing burns and wasted energy. What is most indicative of the Silver Streak’s place in postwar design, however, is what it is made of. Pyrex made its debut in 1915, developed by Corning Glass Works as a heat-resistant glass alternative to metal cookware. Pyrex’s market expanded during World War II due to the demanding nature of wartime manufacturing, which restricted the use of metal for all other products. This metal shortage led to innovative design substitutions, as seen here: where metal would normally have been used, the Silver Streak iron employs Pyrex. The heat-resistant glass that worked well in ovens could now prevent burnt hands while ironing, and its moldable nature allowed for a more ergonomic handle. Although this new use for Pyrex was a success, the colored emulsion under the glass body couldn’t stand the heat. As a result, the colorful Silver Streak – which also came in red, green, and silver, among other hues – was only produced for a short time. Emily Kress was an intern in the Product Design and Decorative Arts Department, Cooper Hewitt, Smithsonian Design Museum.